all the colours of the rainbow - these were the first Opals. Opal is defined as aggregated spheres of amorphous silica, with water filling in between the gaps and has no crystalline structure (SiO2,n H2O). Precious Opal and Potch Opal consist of this kind of structure - the difference being the order and regularity of the sizes of the spheres. Precious Opal shows a play of colours "opalescence" in white light that is due to diffraction from the regular packing of silica spheres of roughly equal size. The colours and patterns are always changing, making opal a gem of infinite beauty. 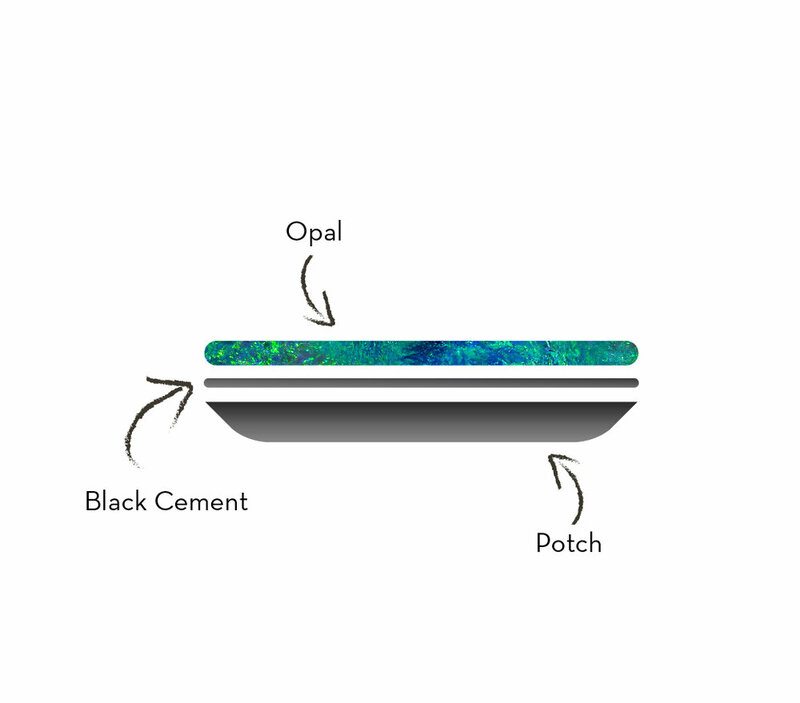 Opal can display all the colours of the spectrum due to the interference and diffraction of light passing through the tiny silica spheres in the structure of the Opal. Opal that shows no play of colours is also composed of the same spherical clusters, but they are non-uniform in size and are not packed in an orderly manner, thus cancel out any possible diffraction of the light. This type of opal is termed as "potch opal" and has little to no value. Opal was first discovered in 1840 by a German Professor and Mineralogist, Johannes Menge in the Adelaide Hills, South Australia. Today, Australia produces over 95% of the world’s supply of precious Opal and 100% of the highest quality gems. They are mined in key areas of three states along the shoreline of what was once an inland sea called the Great Artesian Basin. These areas now form part of the Australian outback - known for its harsh, dry climate and inhospitable living conditions, so surprising that such colourful gemstones are recovered from its soil. Known as Australia’s National Gemstone, opal can convey a mood that is as varied as its type. From the delicate pastel colours of white Coober Pedy opal from South Australia to super-clear crystal opal from Andamooka that is full of light and ablaze with brilliant colour. 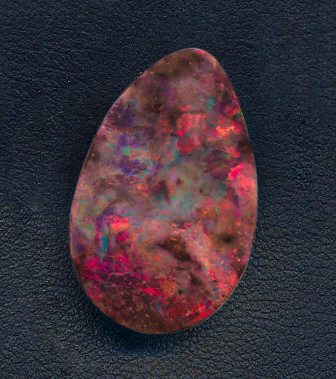 Then you have dramatic streaks of colour that are typical of Queensland boulder opal. This material is found as a vein attached to a dark ironstone host rock and is usually cut to a freeform shape so as to follow the seam of colour, often having an uneven or undulating surface. The most famous of Australian opals - the black opal - resemble brilliant arrays of rainbow colour set against a black or dark background - typical of high-quality material from Lightning Ridge, New South Wales. While found in small amounts in other countries such as Ethiopia, Mexico and the USA, Australian opal is considered the finest and brightest in the world. In fact, designers from all over the world derive inspiration from the rainbow of colours seen in Australian opal such as high jewellery ateliers Piaget, Van Cleef & Arpels and Cartier. Precious Opal is classified on the basis of background colour and the type of colour pattern. Black Opal, darker in colour, displaying all the colours of the rainbow. The name black is only in reference to the dark rock the opal forms in. Only found in Lightning Ridge, NSW. Known to be the rarest of all opals. White, Light, Fire or Crystal Opal has a body colour ranging from milky white to translucent. 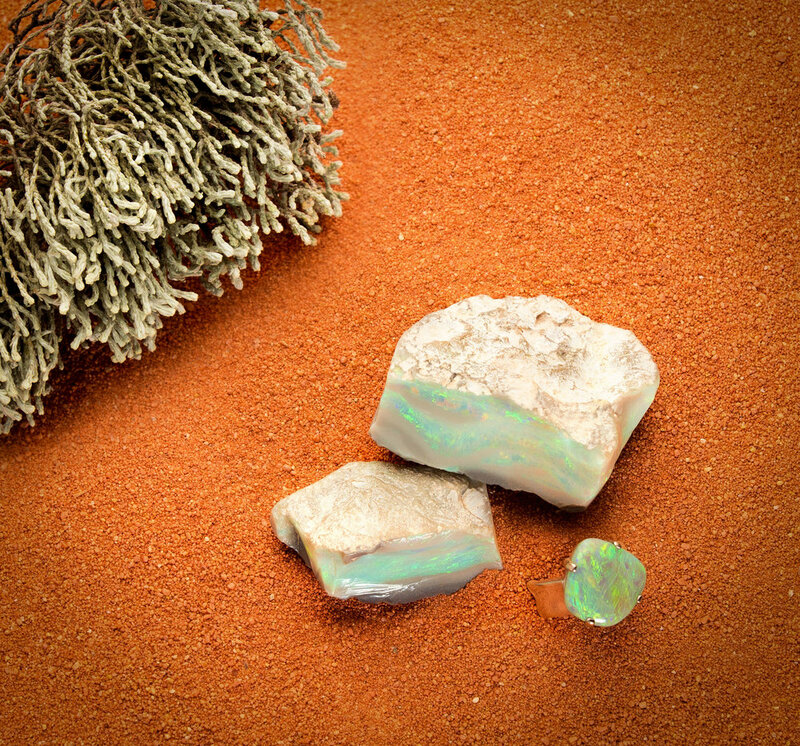 Mostly found in Coober Pedy, South Australia which produces 80% of the worlds opals. Boulder Opal ranges in colour, forming in Iron-Stone and Sand-Stone a rock inseparable from the opal. Similar in colour to Black Opal, Boulder Opal is often cut in to unusual shapes and sizes. Found in Outback Queensland. Many factors must be considered when valuing opal, the intensity or brilliance of colour is of most importance, the finest opals are of maximum brightness and clarity. The stones should be free from obvious flaws on the face of the opal but marks on the base do not affect the value. Consult an opal specialist to help select a gem that is perfect for you - as each opal is one of a kind - just like you.